This vase is Italian Opaline glass, often called Opaline Florence glass, from the Tuscany region of Italy, but it is missing its label. It is cased glass, with an inner layer of white, while the center layer has splattered and drawn swirls of red and green and the outer layer is an amber butterscotch that thickens at the bottom to form the base in a layer about 1/2 inch thick. 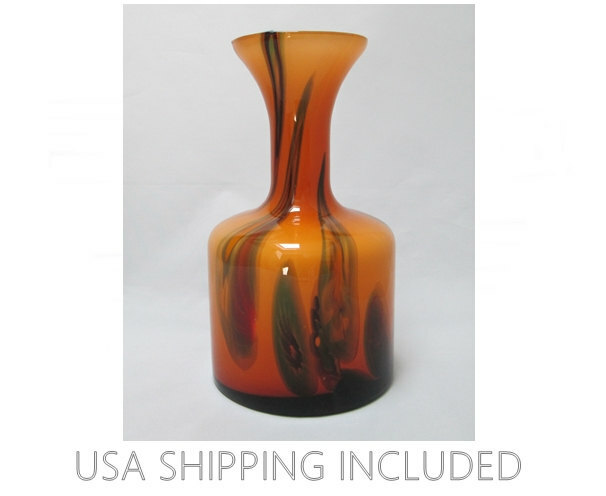 It's hand blown with a smooth ground pontil and just glows with color.